How many times in the last year, have we felt each day begin and end within the four walls of our office or home? Thinking back, there are probably too many to count. Sure, it is easy to get over the boredom by listening to some music or engaging in small chores. But, can it ever measure up to the soothing effect of fresh air or the feeling of warm sunshine hitting the skin? There’s good reason that nature is therapeutic. Many studies have claimed that spending time outdoors can benefit us mentally and physically, in a variety of ways. Has No Societal Influence: Nature is free of trends, competition, technology, and expectations. It helps us detach ourselves from mundane issues and gives our life new perspectives. Enables Perfect Coexistence: A recent study found that people who spend time in nature were more likely to engage in ‘environmentally sustainable’ behavior. Spending time outdoors can make us notice other forms of life that may have seemed insignificant before. We begin to see the difference plants and animals make to our environment and learn how they hold things in perfect balance. Improves Resilience to Stress: There are numerous studies to back the claim that spending timeout in nature can relieve symptoms of depression and improve recovery from stressful events. As a matter of fact, there is a form of therapy, known as ‘Ecotherapy’ that uses nature as a tool. Enhances Creativity: Nature has so many beautiful canvases and brilliant tapestries to offer, which is why it should come as no surprise that so many artists, poets, and writers have found inspiration in it. Studies claim that being in touch with nature helps replenish the ‘supervisory attentional system’. Improves Focus & Concentration: Our indoor environments fail to provide constant stimulation required to keep the brain sharp. Research has proved that natural environments help us feel see life’s bigger picture and improve concentration and focus, because they create a sense of novelty and excitement in the mind. 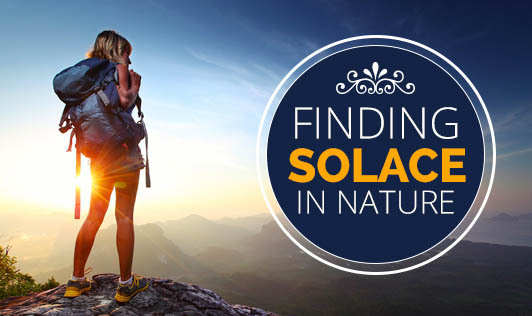 Not just that, nature provides a variety of other soothing experiences to nourish the soul and renew the human spirit. So, the next time you are wondering if you should take that mid-afternoon walk to clear up you head, stop pondering and go right ahead! It is vital to your happiness and wellbeing!